NASHVILLE, Tenn. – A day that united the Seahawks before the game in what Michael Bennett called a “revolutionary” way – both teams staying inside their locker rooms during the national anthem – ended with Seattle damagingly split on the field. Richard Sherman lost his helmet and his head getting steamed at officials for calling three penalties on him – on one play. That negated Chancellor’s interception in the first half. The play could have changed the vaunted defense’s malfunctioning and fatigue that ultimately doomed Seattle in its 33-27 loss to the Tennessee Titans on a steamy Sunday down South. Sherman also argued, pushed and shoved with dozens of Titans after whacking Marcus Mariota after Tennessee’s quarterback had run out of bounds at the end of a scramble. Teammates had to separate the three-time All-Pro cornerback from Tennessee’s irate sideline. The Seahawks’ defense could have used some of that energy before it wilted on an 88-degree day with 97 percent humidity. The unit that had kept Seattle in the first 2½ games of the season got run over in the latter half of Game 3. Tennessee and its power-running game scored 21 points in the third quarter, after the maligned Seattle offense seized a 14-9 lead. 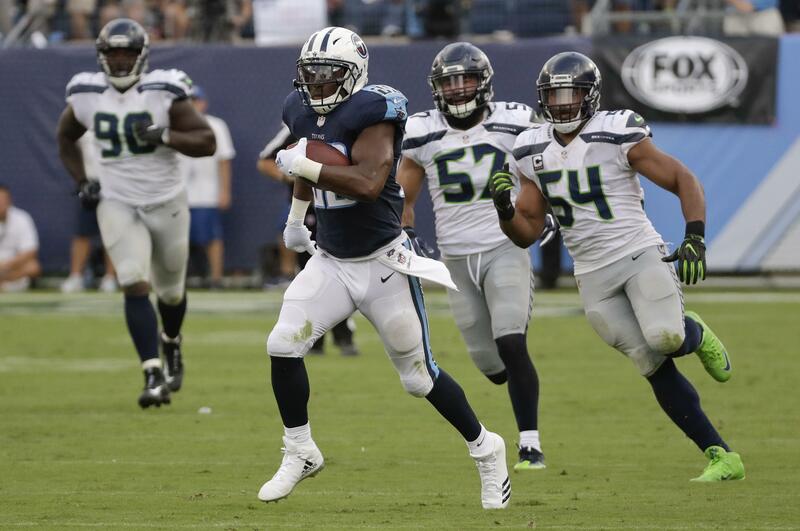 Seahawks’ issues of missed tackles, missed assignments and overwhelming fatigue allowed the Titans to romp for 195 yards rushing. Seattle allowed 165 of those yards on the ground after halftime. The defense let down the offense, for a change. Russell Wilson threw for 373 yards and four touchdowns, completing 29 of his career-high 49 passes. The offensive line provided decent pass protection for large swath of the day. Doug Baldwin had a career-high 10 catches for 105 yards with a touchdown – and moves like a salsa dancer following catches for extra yards. That kind of offense should win games against anyone, even a favorite to win the AFC South. “We’ve got to do a better job. It’s on us,” Seahawks All-Pro middle linebacker Bobby Wagner said, refusing to use fatigue as a reason after his game-high 11 tackles. The 195 yards rushing were the most allowed by Seattle in four years, since Oct. 28, 2013, when it gave up 200 at the Rams. “We get paid a lot of money not to make those kinds of mistakes,” said Pro Bowl outside linebacker K.J. Wright. Wright’s bad angle left him chasing Demarco Murray in vain on Tennessee’s 75-yard touchdown run. That made it 30-14 late in the third quarter. Seattle was in desperation mode from there while falling to 1-2 entering next week’s home game against Indianapolis (1-2 after its 31-28 home victory over winless Cleveland Sunday). Will the leaders of the Seahawks’ defense address its “bickering,” as Chancellor called it. “Yeah. Yeah, we’ll get to it,” Chancellor said. “We were saying something when it first happened. And after awhile, if you start getting into it too much you start losing your energy and your focus. Coach Pete Carroll said he was “disappointed” in his defense. The Seahawks trailed 33-20 through much of the fourth quarter. Then they got to the Tennessee 16 but went backward in large part because of an intentional-grounding penalty on Wilson. He got chased by four Titans pass rushers that beat five Seahawks offensive linemen on second down from the 16 then just chucked the pass from the pocket to no one. With seven minutes left Carroll chose to go for it on fourth-and-22 instead of kick a field goal, perhaps sensing Seattle’s tired defense couldn’t stop Tennessee’s power running. Wilson’s jump-ball desperation pass into the end zone and a mosh pit of seven players got batted down. By the time the Seahawks got down there again, two minutes remained and they were in an all-out fire drill. Wilson’s touchdown pass to Paul Richardson of 8 yards with 1:50 left got Seattle within 33-27. With only one timeout remaining, the Seahawks had to attempt an onside kick. It rolled low and directly to Tennessee’s Delanie Walker to finally end it. Beginning with the last drive of the first half, Seattle’s offense functioned consistently and efficiently for the first time this season. And once again an increase in tempo and use of the no-huddle offense were the sparks. In a hurry, and down 6-0 late in the second quarter, Wilson completed consecutive passes to Baldwin and C.J. Prosise for 82 yards. Then he rolled right and connected with Baldwin at the goal-line pylon to give Seattle a 7-6 lead. Jimmy Graham had five catches for 10 yards for the season until he caught Wilson’s pass and rumbled 26 yards to the Titans 11 on the opening drive of the second half. Without huddling, Wilson then flipped a throw over the middle to rookie Chris Carson. The seventh-round pick started again and played most of the game as Seattle’s lead running back while Thomas Rawls got just a couple snaps and Eddie Lacy was active yet didn’t play. Carson caught the pass and then made a lightning-quick move past the Titans defender for a 10-yard touchdown. The Seahawks led 14-9. Thirty-nine of the Seahawks’ 48 points this season had come on drives that have included no-huddle offense. Graham, the target subject of much discussion already this season, finished with seven catches for 72 yards. The Seahawks gained 306 yards – 263 of it passing – and scored 20 points after halftime. They had scored 21 points total in the first two games. But it ultimately did not matter with all that went wrong on defense. Mental errors. Bad angles. Missed tackles. Blown assignments. And that was all on one play in the fateful third quarter. It started with Seahawks defensive end Frank Clark jumping offside, one of numerous times that happened Sunday. Clark said the Seahawks knew Titans quarterback Marcus Mariota was the best in the league at drawing defensive linemen offside with a hard count. On the free play, Tennessee wide receiver Rishard Matthews took a bubble screen to the left, cut diagonally right to the other hash mark and eluded Chancellor and Jeremy Lane as the Seattle teammates ran into each other near the 10-yard line. Matthews’ 55-yard catch-and-run put the Seahawks behind for good, 16-14. On Tennessee’s next drive, Seattle defensive coordinator Kris Richard was irate, throwing down his hands on the sideline as Mariota ran free past him for 10 yards on a read-option keep no one defended. Then after a defensive holding on Lane, Mariota used some play-action, misdirection fake handoffs to fool Seattle strongside linebacker Michael Wilhoite. Tight end Jonnu Smith, who began the play lined up as a fullback, ran and out-and-up – classic “wheel route” – right past the flat-footed Wilhoite for an easy touchdown pitch and catch. Faster than fiddlin’, Tennessee led 23-14 late in the third quarter. Seattle couldn’t go to the no-huddle again at that point, because the defense was showing its fatigue how tired it was getting. Another Seahawks quick series and punt made that problem worse. Wright had run down speedy Mariota on a scramble earlier in the third quarter. But later in the quarter, Wright chased much more bullish Murray for most of his 75-yard zig and zag through the tired Wright and his teammates. Wright never caught him, and Seattle trailed 30-14. It was the longest run against the Seahawks in the Carroll coaching era. That began in 2010. “Very uncharacteristic of us,” Wright said. Sherman was fortunate to merely play the entire game. The Seahawks’ defense held Tennessee and also-off-target Mariota without a first down until defensive end Cliff Avril jumped offside on third down 12 minutes into the game. Mariota then threw the would-be interception to Chancellor. But Sherman was called for blasting Titans wide receiver Eric Decker to the ground for interference while the pass was in flight. More flags came for Sherman holding Decker to the ground during Chancellor’s interception return, and then for Sherman taking off his helmet to argue his case to officials. After ripping off his helmet, he stalked the sideline official who threw one of the flags 20 yards behind the defense’s huddle. “You can’t take your helmet off,” Carroll said. Tennessee drove on to the game’s first points instead, a 24-yard field goal by Ryan Succop. In that second quarter, the still-steamed Sherman crashed into Mariota’s chest after the quarterback had already been chased out of bounds by Wagner. Sherman’s hit came in the 3-yard painted-white boundary beyond the sideline, and it infuriated the Titans bench. The officials conferred on the field, with one giving a thumbing motion as if to signal an ejection. But Sherman stayed in the game after officials ultimately ruled he was guilty of a live-ball personal foul instead of a dead-ball unsportsmanlike; a second unsportsmanlike foul equals disqualification. But done in by “bickering” and bad defense that undermined the Seahawks’ offense and day. Published: Sept. 24, 2017, 4:36 p.m. Updated: Sept. 24, 2017, 10:25 p.m.